Eleutheromania is Greek for “an intense desire for freedom.” The concept of freedom is a very big topic for a very long list of very big names. However you define it, I was home from Southeast Asia for about three minutes before I got a case of eleutheromania. After a few days of trying to ignore it, I had “strikhedonia,” which in Greek means “the pleasure of saying to hell with it.” I arrived Tuesday night in Athens. I chose Greece because it met my several criteria — to be a destination where I could use frequent flyer miles during the holiday travel season, to be a place I hadn’t visited and to have moderate temperatures. When I booked my trip in October, I planned to focus my journey around Greek mythology and I started reading Ovid’s Metamorphoses at Laura’s suggestion. My mythological plans changed by November but more on that later…. City Circus is a wildly successful “hostel” that caters to youth but more the google types than the scruffier backpacker stereotype.The architecture is very typical for the neighborhood. 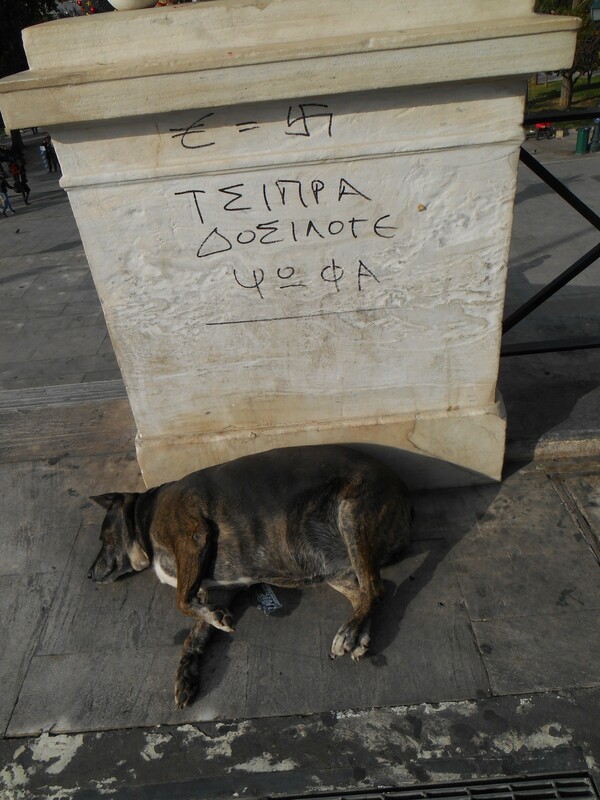 Friends and travel blogs warned me in advance that Athens is hot, dirty and not very interesting. But in December, the city air is clear and cool, and my hotel — City Circus — is located in a partly restored part of the old city called Psirri, where alley ways of cafes and trendy retail are steps from funky auto repair shops and small manufacturing businesses. 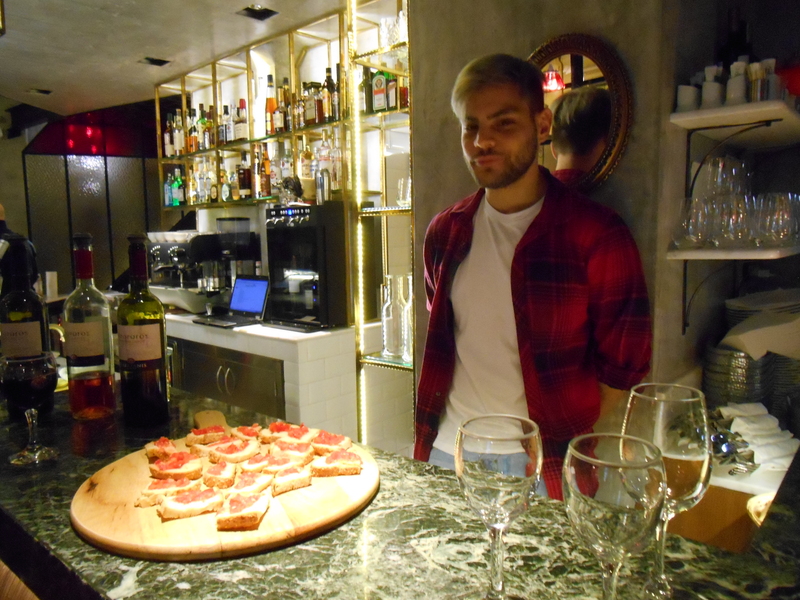 After I dumped my bags in my hotel room, I settled in at the communal table of my hotel restaurant, Zampano, for some not-airplane food. 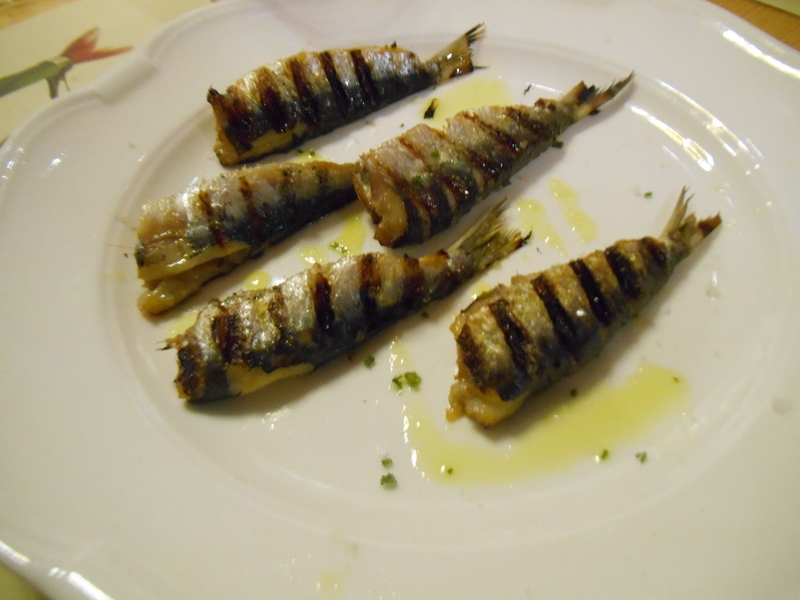 Anthony the bar tender handed me a glass of Greek red and recommended a prix fixe menu, which included a huge greek salad, a bowl of mussels stewed in garlic and ginger, a platter of fava bean hummus with carmelized onions and grilled sardines and another glass of Greek red. All amazing and only 14 euros. Still a little disoriented from 25 hours of travel, I walked around the neighborhood, which was lit up in twinkling holiday lights and full of young people drinking wine in tiny tavernas. 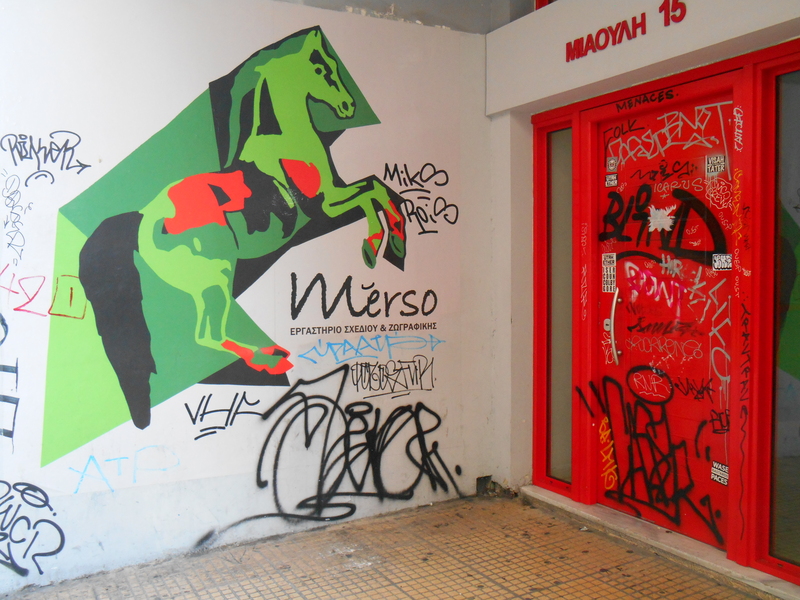 Like many places in Athens, my hotel’s neighborhood is loaded with street art — but unlike Buenos Aires and downtown Oakland, most of it is elaborate and unauthorized tagging. 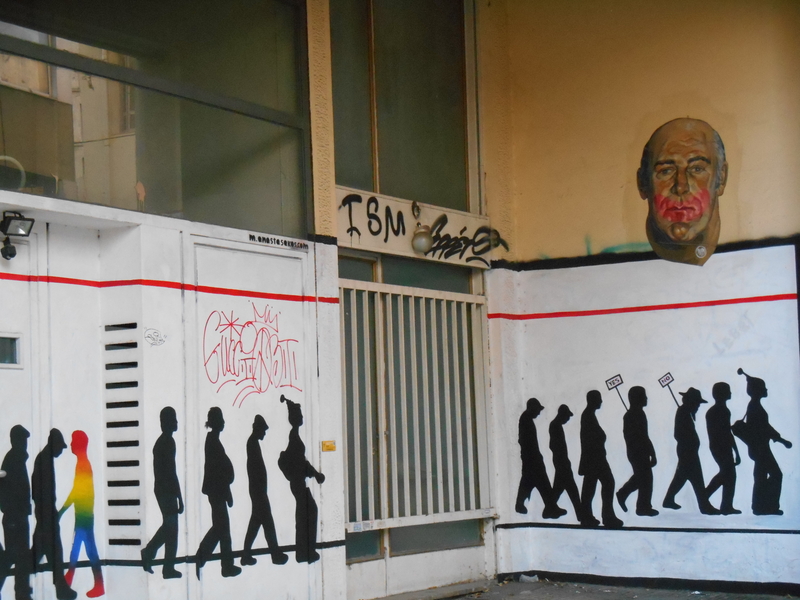 The tagging and the art is an expressive outlet for Athenian youth, a demographic with an unemployment rate of more than 70%. 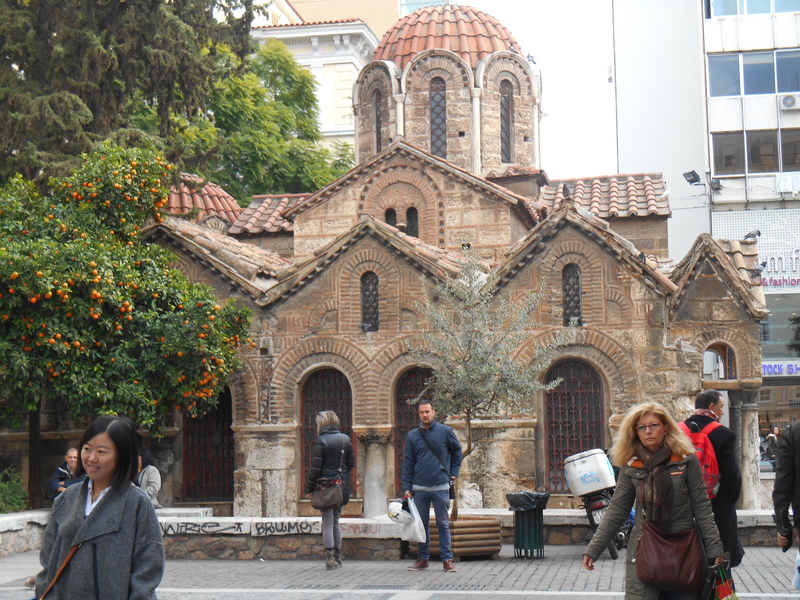 The next morning, I joined a walking tour with Walter, who was born in Athens, raised in North Carolina and returned to Greece about 10 years ago. Walter is good looking and well-spoken, with multiple degrees in the classics. He wore a sports jacket that had seen better days and laughed about how he and his psychologist wife managed to pick two of the worst careers for survival in a collapsed economy. Byantine churches are common in the central part of the City. I awoke to the sound of beautiful church chimes every morning — not just bells, something more elaborate and harmonized. 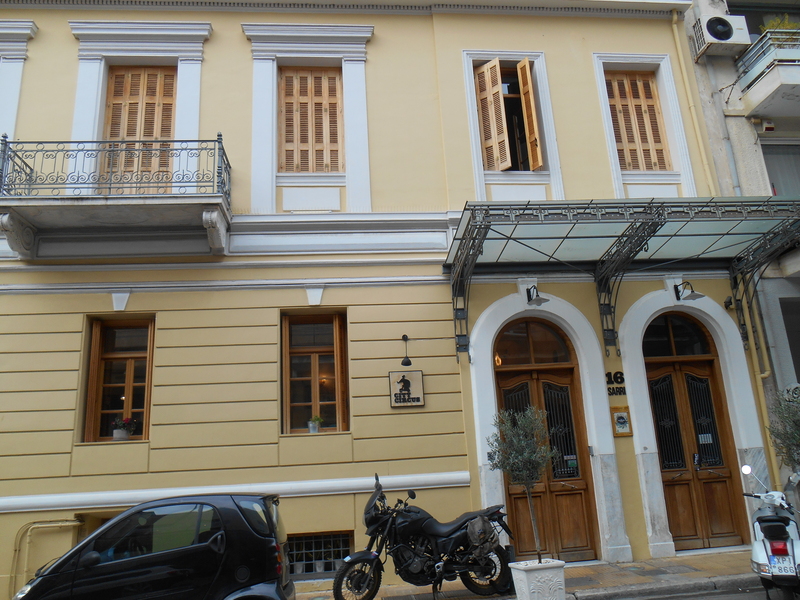 Like many European cities, Athens has a lot of charming tree-lined streets and old buildings with lots of character. In spite of the economic troubles here, the central neighborhoods are full of busy shops and bakeries, cafes and bars. Compared to places like Bangkok and Hanoi, the traffic is minimal and the feeling is relaxed. Of course, Greece is a good place to think about freedom. Greece invented democracy more than 2,500 years ago, lost it two hundred years later to a series of Romans, Byzantines, Ottomans, kings and dictators, and didn’t get it back until 1974 when the Greeks voted to depose their king. Currently, Greece is lead by Alexis Tsipras of the left wing Syriza party. 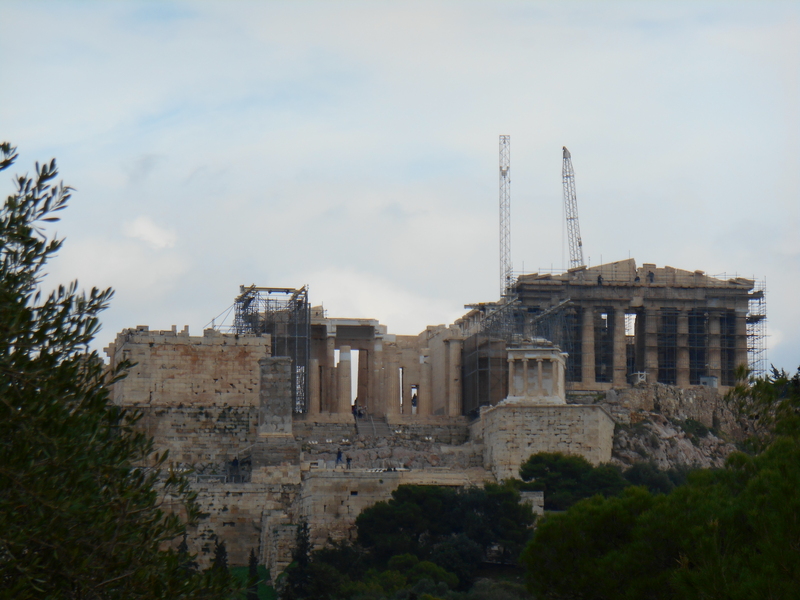 The Acropolis has been in a process of restoration for 40 years. It originally took 16 years to build. Remember when I told you Jesus was not born in Bethlehem and Thailand declared war on the United States in 1942? Well, here is another surprising news flash. The Acropolis, Athens’ most famous site, is not an acropolis. “Acropolis” means “high city” and there are many in Greece. But Athens’ Acropolis was never a city. 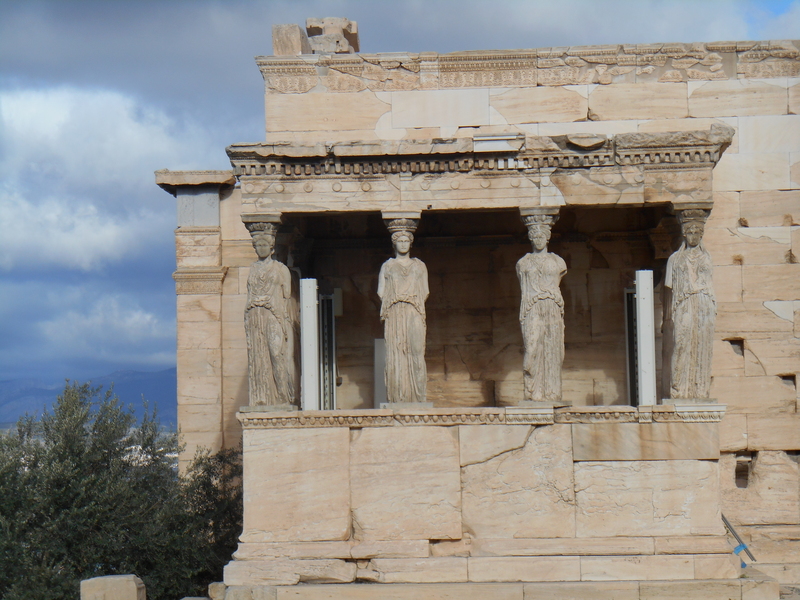 It is a site for temples and honoring Greek gods. So it is called the Acropolis but it’s not one. The most famous temple at the Acropolis is the Parthenon, also known for the friezes the Brits used to call the “Elgin Marbles” because Thomas Bruce, Earl of Elgin, removed them from the Parthenon and shipped them to his estate in England. And he didn’t ask permission. 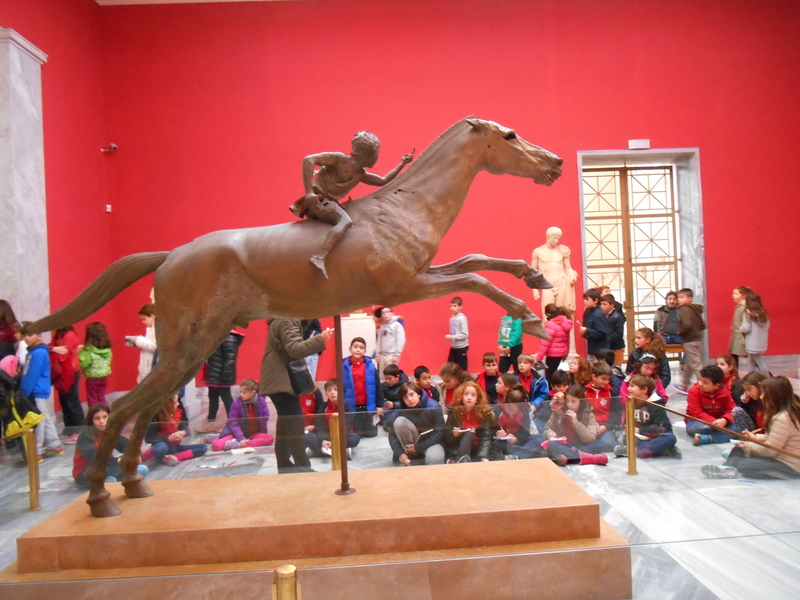 He eventually sold them to the British Museum, which still refuses to return them even after the Greeks built a special museum for their preservation. I know someone who was arrested for possession of stolen property after buying a car stereo at a flea market. One thing Walter emphasized is that although we call Athens the Birthplace of Western Civilization, the Greeks got most of their ideas from the Egyptians. A nice coincidence since I arrived in Cairo last night. Nikos Kazantakis, author of Zorba the Greek. 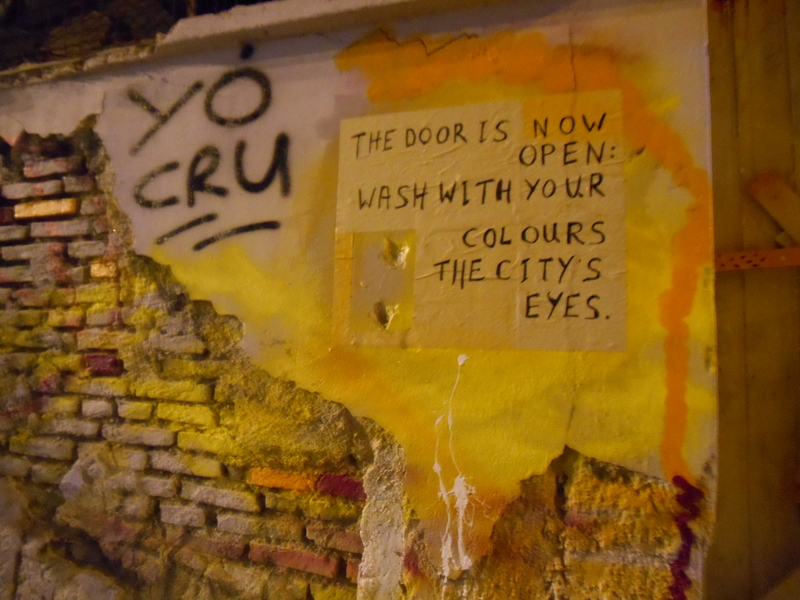 Your photos of street art are unique and wonderful. Thanks for taking us on your journey. I can only echo Jeanne’s comments. Welcome back to the Blogosphere Kim!!! Thank you for the history and philosophical lessons, giving today’s Lesbos more meaningful context. I look forward to your next installment. Be well and Merry Christmas! Kim, love your work. Keep doing what you’re doing.